Playcharts: A Mashup of YouTube And Popular Charts | OhGizmo! Everyone loves a mashup, right? Check this out. It’s no news that major labels are distributing their music videos on YouTube. It was a long time coming, but they finally saw the potential in distributing their stuff on one of the most popular platforms on the planet. Yay! It’s all good except for one thing: what if you’re one of those people who’s constantly asking himself “Hey, what are the kids listening to these days?”. You laugh, but I’m telling you, there’s a whole demographic who’d love to know what’s hot on the charts, watch the videos, but just does not have the time to look it up. That’s where a site like Playcharts.com (careful, autoplay on) comes in. They’re not doing anything revolutionary, unless you consider organizing information the stuff of the Gods. 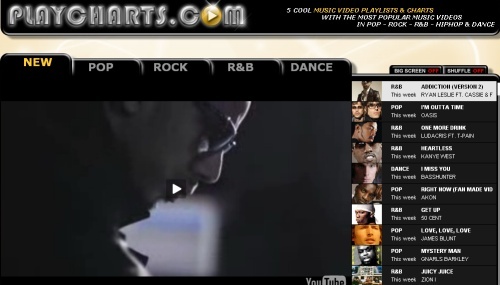 They take five popular charts (Pop, Rock, R&B, Dance and New) and post the YouTube clips in order. Simple as pie, but useful as hell. Now, I bet you there’s a thousand sites like this one, and I’d love to see them in the comments. But for yours truly, it’s a first. And yeah, the autoplay is annoying as anything, but right now it’s just a minor annoyance. Great another way for people to watch the same damn music that's on TV and the radio and iTunes, etc, etc. How about something that isn't top 40 music?